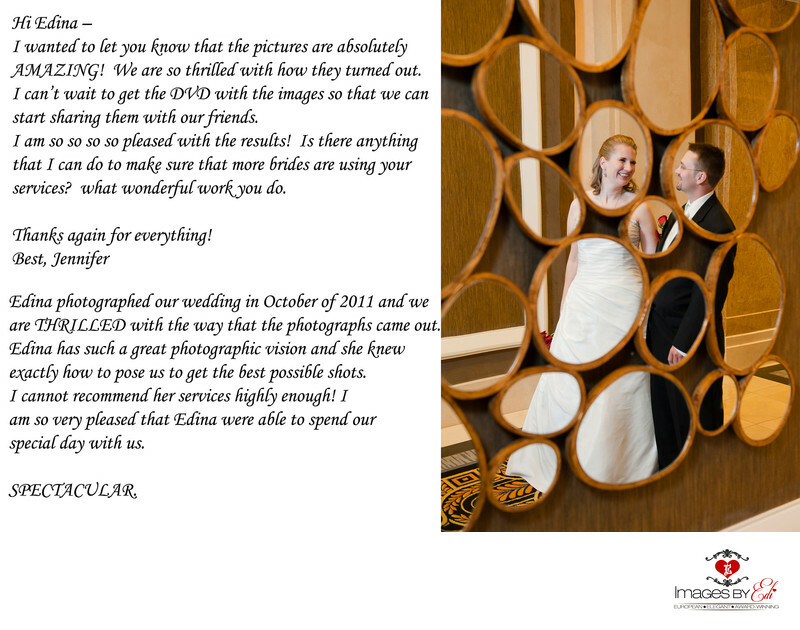 My husband and I absolutely enjoyed working with Edina and when we got our pictures after the wedding we were elated. She is so wonderful to work with, a true artist and professional. Besides her wonderful skill and talent she is so kind, caring and enjoyable to work with. She captured so many great moments! She made us feel so comfortable and it was really fun to do an engagement shoot with her as well. The whole experience exceeded my expectations. The quality of her work combined with her genuine care for your needs, I can honestly say she went above and beyond. She whole heartedly wanted us to be happy. Truly grateful for all that she and her staff did. I would book her again and again. I can not say enough amazing things about Edina our photographer for our wedding on June 25, 2015. Edi is a true professional in every sense of the word. We coordinated the wedding long distance and she made us feel assured and secure in all the wedding plans. She answered all emails and really took time to get to know what we wanted in our wedding photos. She also came with ideas. The photos that she took are stunning. The day of the wedding she work tirelessly to make sure the lighting and shots were just right. She was flexible with time and made sure to get all out shots. It was 113 degrees in Las Vegas, but that didn't stop her from capturing ever moment. I would highly recommend her for ANY event!! Images by Edi was fantastic! I was a destination bride and Edi made the planning process so easy. I took a trip to Las Vegas to meet potential vendors and once I met with Edi I did not need to meet with any other photographers. I spent 3 hours with her during our initial meeting discussing every detail and she never once tried to rush me. She even had some healthy Vegan snacks to offer me during the meeting when I told her I was a Vegan! On the wedding day Edi and her assistant were amazing. The were calm and organized and always knew what to do and where we should be even when me or our wedding party did not. Edi had suggested we do a day of photography on the Las Vegas strip the day after the wedding as my husband and I really wanted some photos on the strip but our actual wedding was out at Lake Las Vegas. At first I was skeptical however I think it was the best decision we could have made. It was so special and romantic the day after the wedding to get dressed up again and take photos with just my husband and I. There was no stress of the wedding day anymore and we could just relax and have fun and enjoy a special moment. I would highly recommend doing this to anyone who is not immediately leaving on their honeymoon and has the time. We have now received our images from the wedding and let me tell you I am so happy we chose Images by Edi. Our photos are absolutely AMAZING! The hardest part was trying to narrow down the images to select some for our album because I loved them all. I would highly recommend Images by Edi to anyone. Photography was really important to my husband and I and were were extremely impressed by Images by Edi right from the planning process to the end result. A wonderful experience & gorgeous photos! First, I am extremely picky about photographers, as I have experience in that area. I wanted beautiful wedding photos that looked REAL, not stiff poses. Ours was a destination wedding and the hotel's package included photography after the ceremony, but I was worried about their quality. I'm so glad that I booked with EDI, the other photographer wasn't very good. EDI's photos blow them out of the water. Edina and her assistant (who's name I forgot, but she was lovely!) were absolutely incredible. We discussed locations beforehand and EDI took charge of the whole operation (a big relief for me), instructing the limo driver and getting the photos at each location at just the right time of the evening. The photos are stunning, everyone we've shown them to said they are the most beautiful wedding photos they've ever seen. Seriously. And it was so much more than just a photo shoot, EDI made it an EXPERIENCE. It was wonderful and unforgettable, we felt like movie stars! The photos are even better than I could've hoped for, I love them! We might have to hire EDI again for anniversary pictures someday! Perfection, ease, oh so many words! She was amazing! She fit in with whatever was going on from our elegant to our party bus craziness! She made us feel comfortable and that says a lot for 2 shy people who hate getting pictures taken. They turned out better then one could even imagine. I would do it all over again in a heart beat! She has the correct equipment to really capture and light up whats needed to! That light bar did a world of difference and I did so much research before I contacted her and she is the best of the best hands down. I loved her so much and was sad saying bye at the end of the evening. She's really an amazing photographer. Thank you so much for the fabulous photographs edi, we love it so much. it's really worth hiring her for your wedding. My best friend hired Images by EDI to shoot my Las Vegas wedding party after our ceremony on the strip. She was fantastic!!! Super easy to work with, really caught the essence of who we are and took tons of beautiful pictures everywhere we asked. 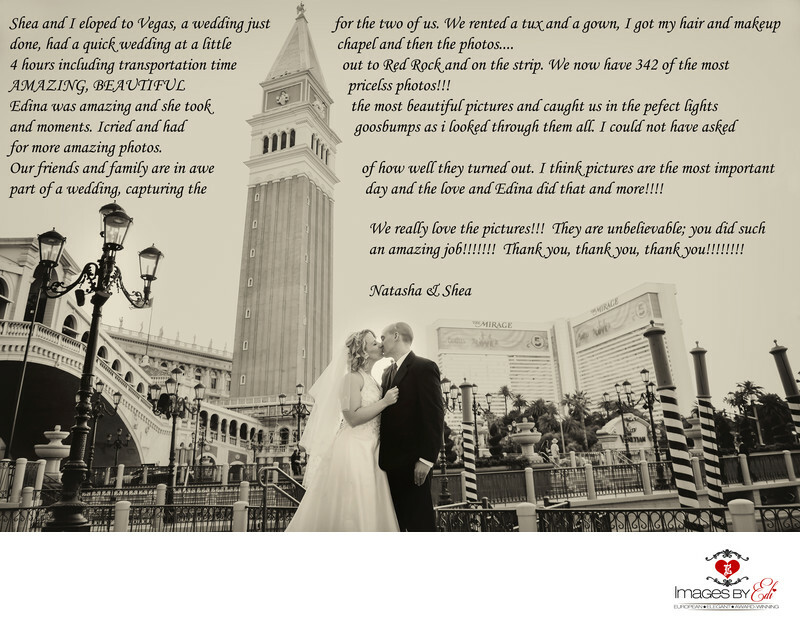 I would definitely recommend her to anyone who is planning a Vegas wedding!!! Our pictures are storybook and will be treasured forever thanks to her talents. Edi is a very talented photographer. Her creative style and professionalism totally exceeded our expectations. We hired her to photograph a 50th Wedding renewal. She took the time to go over what shots were really important and made sure she was able to capture those images. As stressful as weddings are, she and her crew were very patient and she was even able to get shots that we would've forgotten about and/or didn't realize we wanted. Edi was always quick to respond to any questions or concerns we had and had the photos ready for us in a timely fashion. She has the ability to put photo albums together, creating a story which is amazing. She has definitely become our "go to" photographer, which we've also hired her to do family photos and have referred her several times without hesitation. Edi is an absolute delight. We are not from the Las Vegas area, so we were not able to do a lot of meeting with her. We met once about 8 months before the wedding and that was to pick a photographer. We met at her and got to see her portfolios and hardware far in advanced. My wife and I had 3 photographer to chose from based on reviews. The house photographer although equally as talented we felt just was a little too expensive vs what we could get with Edi. In addition she had also shot weddings at the venue we were at, and Edi has similar styles which made her perfect. Everything leading up to the week of the wedding in terms of contact was through email and mailing of the payment. On the day of the wedding, she arrived earlier than the wedding party and started on taking shots of the ceremony area and fill shots (reception, close-ups of place settings, guest book, etc.). Included in the package we bought, we booked her and an assistant. She started with the bridal party and then came downstairs to where the groomsmen were. The majority of the shots of the bridal party were taken in the “green room” because of the size of the room and the view overlooking the venue. The groomsmen photos were split with us getting ready and then outside for some posing shots. Edi kept the bride inside because the heat. We also received an additional photographer (which she threw in) to help with the ceremony and the cocktail hour before everyone entered into the reception area. Both she and the second photographer ran two cameras throughout the ceremony and her assistant had a camera at that time (3 shooters). Intimate shots were taken of us after the ceremony with the wedding party and family. We then proceeded to drive around the grounds of the venue for more photos with Edi and her assistant. Shots were done quickly with little wait time. At my sister’s wedding her photographer took minutes between shots a lot because he didn’t like the shot and had to reset or reviewing took too long. The ceremony was also pain free. Edi did get in front to get the shots she needed, but she was courteous to the guests who were also trying to get that special shot. I would totally recommend Edi to anyone needing a true professional. Her photos have a very contemporary style with classic elements to please. She has been doing this for a long time and knows how to get from A to Z while giving an enjoyable experience. She is definitely worth it. Images By Edi was awesome! 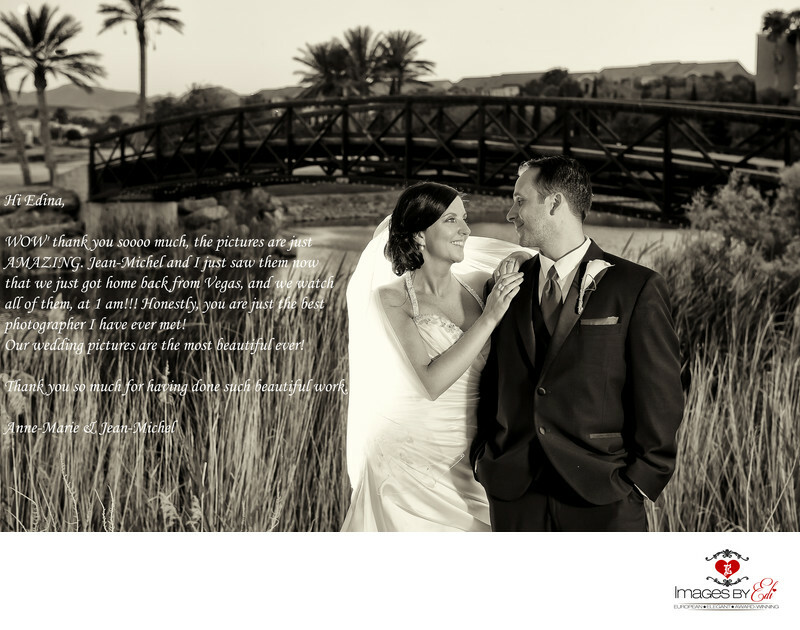 Images by Edi was a perfect fit for our destination wedding to Lake Las Vegas. After 12 years of dating we took just a few months to plan our nuptials. Edina was referred to my by Debbie, wedding coordinator at Hilton Lake Las Vegas and she did not disappoint. Her creativity and talent captured the joy of our day for sure! Many of the wedding details were hand made including broach bouquets from family jewelry, peacock feathers from a family friend's birds and a wooden bowl handcarved by my father to carry the rings down the isle. Edi captured images of all of our details in such an artful way--help us savor the memory for many years to come. Some of my favorite images are the candids she took of us interacting wtih guests without anyone even knowing! She even got access to a high hotel balcony in order to take an areal photo of all guests in the gardens--and everyone's eyes were opened! Having access to all of the photos online was a great benefit to family and friends who wanted to have immediate access to our photos. She artfully combined color and black and white to enhance the images to make them even more beautiful! To any bride I would wholeheartedly recommend Images by Edi to produce beautiful captured memories for your special day. Had so much fun with our photo shoot. Our elopement was somewhat last minute and there was great effort to accommodate our date and time due to being from out of town. Love our photos and will cherish them forever!!!!" Edina and her team are amazing. My now husband loved seeing the metallic prints she had on display at a bridal show where we first met her. After deciding we did need to hire a professional and not just have a friend do it we emailed Edina to see if she would be willing. From meeting with her to plan out our wedding photography schedule to having her take our engagement photos-- she and her team members were always on time, she had the right equipment for the shoots she was doing and it clearly shows in the photos. Edina was receptive to everything I had to say and would give her expert opinion when it came to capturing the images we wanted. Now that the wedding is over and I see all the lower quality cell phone photos that were taken I'm so glad I hired her. We received many images from Edina and each one is beautiful. I can't believe how she managed to make me look so wonderful, but she really did and I'm not one to enjoy being photographed. Her lighting equipment is amazing too. The way she was able to light the back of my veil in some of the pictures is truly stunning. I would recommend Edina to any couple getting married. She is very professional and her experience with how to shoot weddings clearly shows. As someone who has never planned a wedding before, having her there turned out to be more valuable than I imagined. She knows how to position family members and how to even get the little flower girl's attention. Edina really cares about her work and about the couples she works with. She never made me feel like just another bride. The quality of her work and how she interacts with the subjects she's photographing is what makes her an exceptional photographer. As a bride one of the biggest things to my concern was who I was going to choose to do my photographs. We got married out of town and it was so hard to do so much research to find a great photographer that fit our budget. I researched Images by EDI and fell in love with her work! Not only is she so good at her job, she is one of the nicest women I have ever met. She was so accommodating and made arrangements to meet with me once I got into town to review everything I was expecting from her on the wedding day. She got my images back to me within a wonderful timely manner and literally I looked like I was out of a magazine! There wasn't a single image I did not like. She was amazing at her job and I felt like I had known her before we had ever met. I highly highly recommend hiring her! You will NOT be disappointed I promise! Thank you Edina for making my day super special and providing me quality images that I look back to every day! My husband and I planned our wedding from NJ. We traveled to Las Vegas and met with vendors but once we met Edi we knew she was the perfect fit for our photographer for our big day! Edi listened to all our dream details for our big day, showed us her albums and photos, and was so gracious. Being the detailed people we are, we even facetimed a week before the wedding! The day of our wedding, Edi did a wonderful job of giving my husband and I tips on how to look "natural" as this isn't something that comes natural! But you would never know if you saw our pictures! We like so many, in fact, we couldn't cut photos so we just got more pages in our album! Edi captured beautiful photos of the most amazing day of our lives and we can't wait to get our album and enjoy it for the rest of our lives!! My husband and I absolutely enjoyed working with Edina. this was the first photoshoot we ever did after our marriage. We were celebrating third wedding anniversary. When we got our pictures after the wedding we were overjoyed. All our friends and family gave us amazing feedback on the photos. She is so wonderful to work with, a true artist and professional. During the photoshoot she took us to places on the Strip Las Vegas where we might have not gone on our own. Beautiful views of the city was an added bonus. The day was crowded in Vegas but when we saw the final result in pictures, they were so clean without any noise or unwanted objects. Stop searching for a photographer and book EDI TODAY!! Edi was the most pleasant photographer to work with and the most amazing person. We booked Edi to photograph my parents 50th wedding anniversary. Working with a large family group and with all the many little changes and surprises along the way, Edi was so patient and pleasant the entire day and she really put our needs first. Out of all the weddings and events I've been to, you can really see what a professional Edi is. Not only does she care about getting those special moments on camera, she really pays attention to what is going on around the event and the people who are in it. We were so pleased with Edi during the event and the best part, her pictures really blew us away. She was able to capture those special moments that we didn't even see happening. She made sure every person in the party had their own special moment and she was there to capture it all. Edi paid special attention to details throughout the day and night and even informed me that she could tell my mother was tired from standing and needed to sit down. This truly meant so much to us. Edi was so amazing. It's refreshing to have a great photographer who can have fun, laugh and adapt to different situations and not get upset because you want a certain picture taken. Edi is what a true photographer should be like for any event. Even though we were in a panic to find a last minute photographer with only a few weeks away until the event, Edi was meant to be for us. The day couldn't have been more perfect and it was truly because she cares about her job and also because she cares about the people she works with. To me, that says so much about the type of photographer you want for your special once in a lifetime event. Edi is the perfect photographer! We would HIGHLY, HIGHLY recommend Images by Edi for any photography needs! We can't say enough great things about you. You were absolutely fantastic! All the guests and wedding party went on and on about how hard working and professional you are. We are so so grateful that you were able to shoot our wedding. Thank you so much! Hi Edina! I am BLOWN AWAY by our wedding photos. OMG. You are absolutely amazing!!!!!!! Thank you for doing such a fantastic job!!!!!!!! We are so fortunate to have worked with you as you have exceeded our expectations! Edina, Thank you for capturing our special day through your vivid photography. You have provided us a chance to retell our story time and time again through your amazing images. I am in awe of all the special moments and interactions you have gotten between us, family, and friends on our wedding day. You have captured a time in our lives that we will always cherish and through your posing advice, timing, and your creative mind you delivered a magnificent representation of our wedding day. The portraits are breathtaking and as I go through these images it brings me back to that day when Derek and I became husband and wife. As we will always have the memories in our minds we will now have remarkable depictions to show and relive. 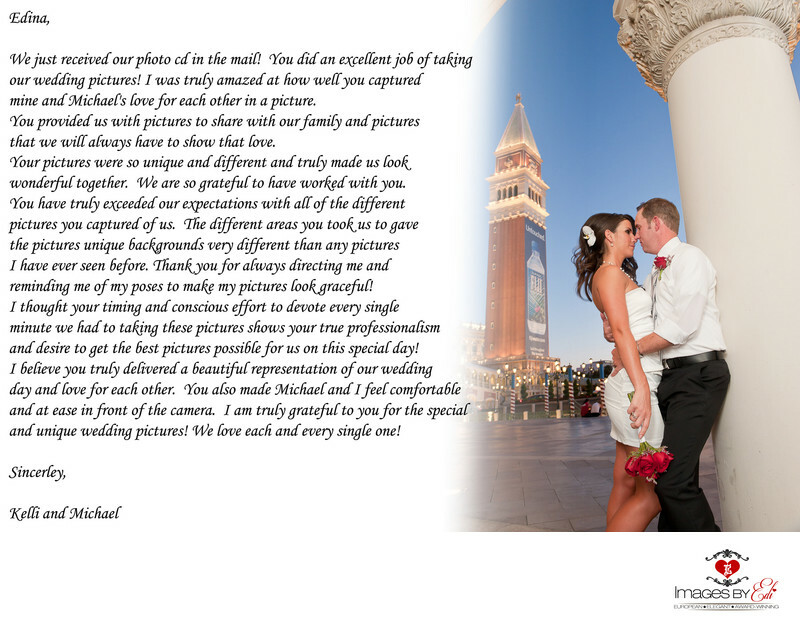 We are so fortunate to have worked with you as you have exceeded our expectations and truly delivered a beautiful, vivid, and artistic representation of our magnificent wedding day. You not only produced superb work but also made all feel so comfortable and at ease in front of the camera. When working with you the saying is true a picture is worth a thousands words. Thanks, Edina. We LOVE the pics!! You ROCK! Everyone has raved about how talented you are! Thank you again! Hi Edina, WOW' thank you soooo much, the pictures are just AMAZING. Jean-Michel and i just saw them now that we just got home back from vegas, and we watch all of them, at 1h00 am!!! Honestly, you are just the better photographer i have ever met! Our wedding pictures are the most beautiful ever! Thank you so much for having done a such beautiful work. Hi Edi, We've got the album!!! It is very amazing, thank you so much, this is the most beautiful we've ever seen!!! Hope you would be closer to take the pictures of our baby who's coming on February!!!! Thank you for everything, again and again!! 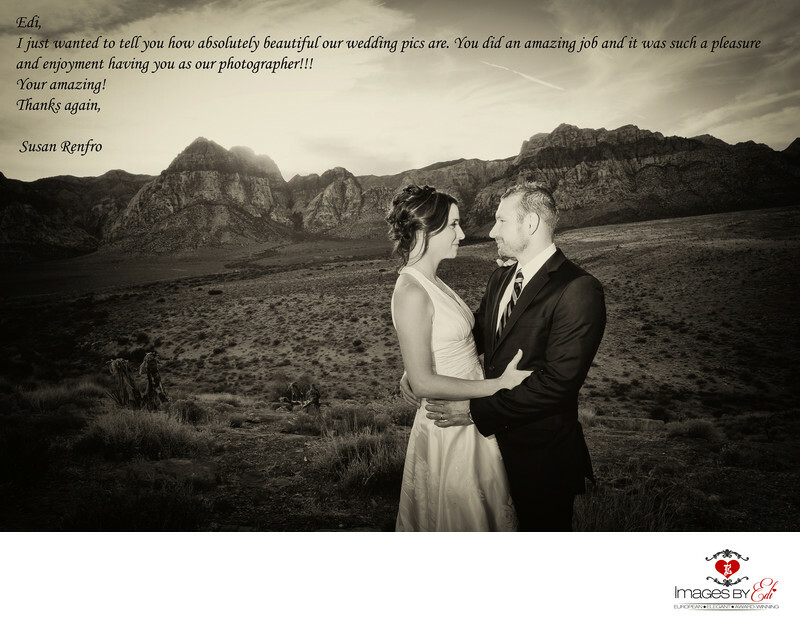 Thank you so very much for the wonderful job you did photographing our wedding. 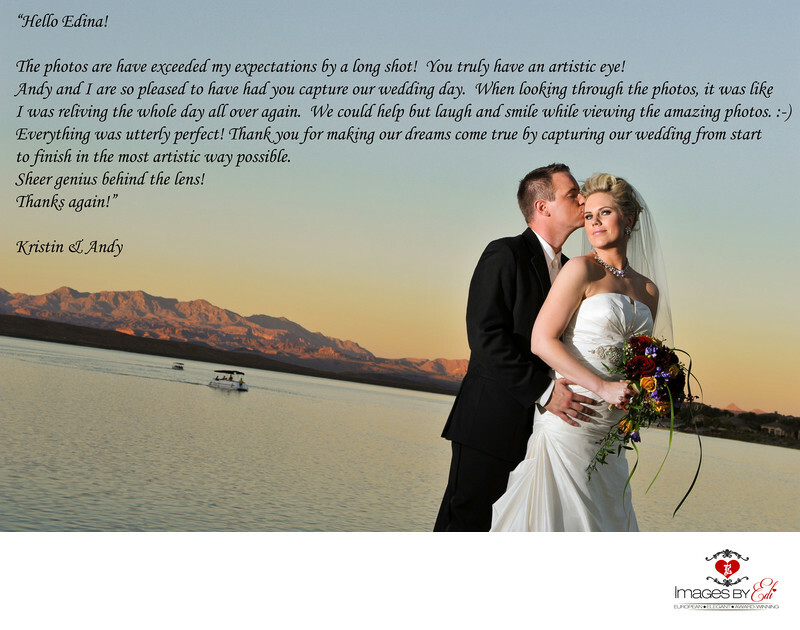 Your artistic style came through in all the pictures, which was a major reason we chose you to photograph our wedding. You and your team were extremely professional and guided us through the process of capturing all the special moments of our wedding day. You ensured you knew what photos we wanted prior to the wedding so you could keep us on track and ensured all guests were photographed that we wanted as part of our wedding memories. The wedding books turned out absolutely amazing, and are unlike any wedding books I have seen. We just want to say thank you again for everything you put into making our wedding day so incredible and more than we ever imagined it could be!